The teaching materials for the learning experience on “Acquiring Spiritual Knowledge” are divided into four parts. In part 1, students will study paragraphs 1 and 2 of this section in the Doctrinal Mastery Core Document, they will study Doctrine and Covenants 88:118 and how to learn by study and faith, and they will study Doctrine and Covenants 8:2–3 and learn about receiving revelation through the Holy Ghost. Note: Parts 1 and 2 of this learning experience can be taught over the course of two 40-minute class sessions, or they can be combined and taught in one 80-minute session. Part 3 contains a doctrinal mastery cumulative review activity that can be taught in approximately 15 minutes. Part 4 is a review of the principles of acquiring spiritual knowledge. You could choose to teach this review one or more times as needed during the school year, such as at the beginning of the second half of this seminary course. Write the following question on the board: What is an experience you have had in which you recognized that you needed to seek knowledge from your Heavenly Father? Ask students to ponder their response to this question. To help them think of experiences, you might ask them to consider times when they may have sought a testimony of the truthfulness of the Book of Mormon, the calling of Joseph Smith as a prophet of God, or The Church of Jesus Christ of Latter-day Saints. Explain that during their experience in seminary, students will have many opportunities to increase their understanding of how to obtain spiritual knowledge from Heavenly Father. Doctrinal Mastery is one of these opportunities and provides ways to apply principles of acquiring spiritual knowledge and to develop a deeper understanding of key points of doctrine of the gospel of Jesus Christ. Provide students with copies of the Doctrinal Mastery Core Document, and ask them to open to the “Acquiring Spiritual Knowledge” section. Invite a student to read paragraph 1 aloud. Ask the class to follow along, looking for what this paragraph teaches about the source of all truth. Who is the source of all truth? To help students understand the context of Doctrine and Covenants 88:118, explain that the Lord revealed the instructions for learning recorded in this verse while commanding early Church members to organize a school for religious instruction. Invite a student to read Doctrine and Covenants 88:118 aloud. Ask the class to follow along, looking for what the Lord taught about how we are to seek learning. Invite students to report what they find. Why do you think it is important that we “seek learning … by study”? In your experience, why are these some of the best books we can choose to study? What do you think it means to seek learning by faith? Invite a student to read aloud the following statement by Elder David A. Bednar of the Quorum of the Twelve Apostles. Ask the class to listen for what Elder Bednar taught about what it means to seek learning by faith. “… Learning by faith cannot be transferred from an instructor to a student through a lecture, a demonstration, or an experiential exercise; rather, a student must exercise faith and act in order to obtain the knowledge for himself or herself” (David A. Bednar, “Seek Learning by Faith,” Ensign, Sept. 2007, 64). What stands out to you in Elder Bednar’s description of learning by faith? What are some things you can do to seek learning by faith? Invite a student to read aloud the last sentence in paragraph 1 of the “Acquiring Spiritual Knowledge” section in the Doctrinal Mastery Core Document. Ask the class to follow along, looking for what Heavenly Father has promised to do as we strive to learn by faith and diligently seek Him. To help students understand the context of Doctrine and Covenants 8:2–3, explain that in this passage the Lord was speaking to Oliver Cowdery. When Oliver was helping the Prophet Joseph Smith during the process of translating the Book of Mormon, he desired the gift of translation himself. In response, the Lord revealed how to receive and recognize revelation from God. Invite a student to read Doctrine and Covenants 8:2–3 aloud. Ask the class to follow along, looking for words or phrases that help teach the key statement of doctrine they just identified. Point out that sometimes we may wonder whether a particular thought, feeling, or prompting has come from the Holy Ghost or is simply our own. Ask students to raise their hand if they have ever had a question about this. Explain that rather than giving the students an answer to such a question, you will provide them an opportunity to “seek learning, even by study and also by faith” (D&C 88:118) to find answers to this question themselves. How Can I Know Whether a Thought, Feeling, or Prompting Comes from the Holy Ghost? “How do we know the things of the Spirit? How do we know that it is from God? By the fruits of it. If it leads to growth and development, if it leads to faith and testimony, if it leads to a better way of doing things, if it leads to godliness, then it is of God. If it tears us down, if it brings us into darkness, if it confuses us and worries us, if it leads to faithlessness, then it is of the devil” ( Teachings of Presidents of the Church: Gordon B. Hinckley , 121). What did you learn from Moroni 7:12–13 and the statement by President Hinckley that can help you know whether a thought, feeling, or prompting comes from the Holy Ghost? Read Doctrine and Covenants 11:12–14 and the following statement by Elder Ronald A. Rasband of the Quorum of the Twelve Apostles, looking for counsel that can help you know whether a thought, feeling, or prompting comes from the Holy Ghost. Consider marking words or phrases that stand out to you. “First promptings are pure inspiration from heaven. When they confirm or testify to us, we need to recognize them for what they are and never let them slip past” (Ronald A. Rasband, “Let the Holy Spirit Guide,” Ensign or Liahona, May 2017, 94–96). 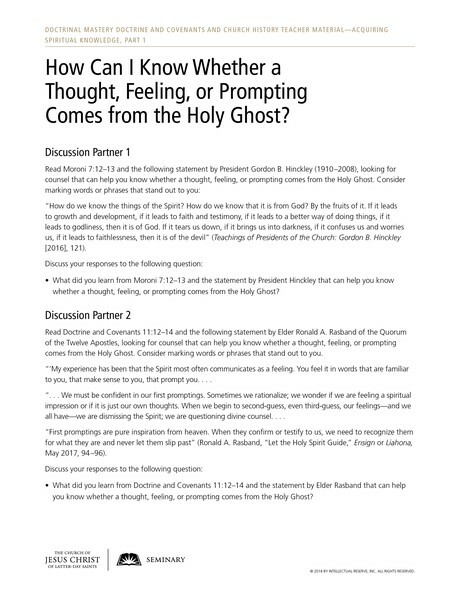 What did you learn from Doctrine and Covenants 11:12–14 and the statement by Elder Rasband that can help you know whether a thought, feeling, or prompting comes from the Holy Ghost? Invite several students to summarize for the class what they learned about recognizing thoughts, feelings, and promptings that come from the Holy Ghost. Invite a student to read aloud paragraph 2 of the “Acquiring Spiritual Knowledge” section in the Doctrinal Mastery Core Document. Ask the class to follow along, looking for what we can do to invite the Holy Ghost to reveal truth to us. Invite students to consider marking words or phrases that stand out to them. According to this paragraph, what can we do to invite the Holy Ghost to reveal truth to us? Refer to the question on the board that you asked students to ponder at the beginning of class: “What is an experience you have had in which you recognized that you needed to seek knowledge from your Heavenly Father?” Invite students to share experiences in which they sought and received knowledge from Heavenly Father by applying the principles discussed in this lesson. You may also want to share an experience of your own. Testify that we can progress toward becoming like our Heavenly Father as we seek learning by study and also by faith and that He will reveal truth to our minds and hearts through the Holy Ghost as we diligently seek Him. Invite students to continually apply these principles in their lives. The following review activities are not intended to be taught during the same class session as this lesson—“Acquiring Spiritual Knowledge, Part 1.” They are intended to be used during seminary class sessions that take place after you have taught this lesson but before you teach “Acquiring Spiritual Knowledge, Part 2.” These short reviews can be taught at the beginning or end of classes in which you teach a regular sequential scripture lesson from the Doctrine and Covenants. Be sure that these reviews take no longer than five minutes, so as not to take away from the scripture block students will be studying in class. Invite students to silently read Doctrine and Covenants 88:118 and identify which statement on the board comes from that verse. Invite them to locate the key statement of doctrine in the first paragraph of the Doctrinal Mastery Core Document that is associated with this doctrinal mastery passage (Because our Heavenly Father loves us and wants us to progress toward becoming like Him, He has encouraged us to “seek learning, even by study and also by faith.”) Invite students to repeat this key statement of doctrine aloud multiple times. Draw on the board or display the accompanying pictures of a mind and a heart. Invite students to look in paragraph 1 of the “Acquiring Spiritual Knowledge” section in the Doctrinal Mastery Core Document and find the key statement of doctrine and the doctrinal mastery passage that are best illustrated by the pictures. (Students should identify the following key statement of doctrine and scripture mastery passage: [God] has promised to reveal truth to our minds and hearts through the Holy Ghost if we will diligently seek Him [D&C 8:2–3]). Invite students to read Doctrine and Covenants 8:2–3 aloud together while placing four fingers of one hand on their forehead and four fingers of the other hand over their heart. Explain that together the four fingers of each hand add up to a total of eight, which corresponds with section 8 of the Doctrine and Covenants. Consider showing the video “Ask of God (2017 Mutual Theme)” (3:21), which is available on LDS.org. This video provides examples of questions youth asked Heavenly Father and the answers they received. To help students understand how to determine if a particular thought or feeling is from the Holy Ghost or is simply their own, consider showing the video “Patterns of Light: Discerning Light” (2:12), which is available on LDS.org. In this video Elder David A. Bednar of the Quorum of the Twelve Apostles explains how we can recognize divine light and discern it from our own thoughts. After the video, consider discussing what the students learned as they listened to Elder Bednar.